If you want to add Active Directory user or group to the local administrator group on a computer, you can use Powershell. To add user or group, we can use the cmdlet Invoke-Command associated with net localgroup. It is also possible to add a computer account into local Administrator group, you can use the command above but don’t forget to add the $ at the end of computer name. You can get more informations about net localgroup here. To continue in Powershell posts, we will see how to change the local description of the server. Not in Active Directory attribute but on the computer itself. The local description is set is the WMI of the server. In the class Win32_OperatingSystem. To change it, we need to get the objects, set the new content and save the modification. It is possible to modify the description on a remote computer, however, we need to adapt the script if the string is store in a variable. With the Invoke-Command we add the parameter –ArgumentList, so that our variable content will be available on the execution on the remote host. Did you know that you can manage disks, partitions and volumes using Powershell? Microsoft released a lot of cmdlet in order to facilitate handling of disks. With virtualization, you can easily add disk to your server, but you have to create the volume yourself. I wrote a script that you can integrate in your process, runbooks or others. First thing to do, is to prepare disks to host volume. We need to set disks online and to disable Read only. Once disks are ready, we need to create, and format volume. You can get more information about Disk Management cmdlet here. 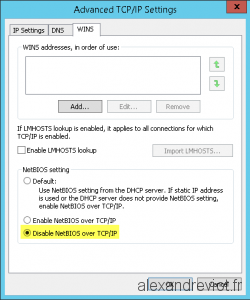 0: Enable Netbios via DHCP. 1: Enable Netbios on the interface. 2: Disable Netbios on the interface.